This model was actually made for a painting competition at a convention in Copenhagen held December 3rd 1999. Unfortunately, I never made it to the competition since Denmark was almost overthrown by a terribly storm the night before the competition and there was no means of transportation available. Instead I entered the model at the GD UK the following year where it placed 1st in the 40K single category. My inspiration clearly comes from the works of John Blanche - both his art and figures. 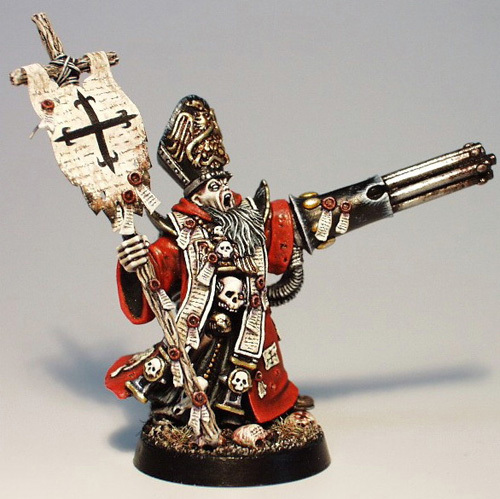 The scatterlaser is the most obvious Blanche-quotation referring to an outrageous Renegade Psyker featured in a mid-90s Citadel Painting Guide.